We are frightened of forgetting. There is a desperation to herd every scrap of memory we have and lock them up in the boxcars of social media platforms, to freeze every sunset and moonrise and planetary wobble, to regurgitate every great meal into byte-sized photos. We facebook our friends and foursquare our footfalls. We tweet and tumble, flick and link, blog, bing, broadcast and podcast our every waking thought. In One in Mind, Winner Jumalon allows us access to his own external memories. 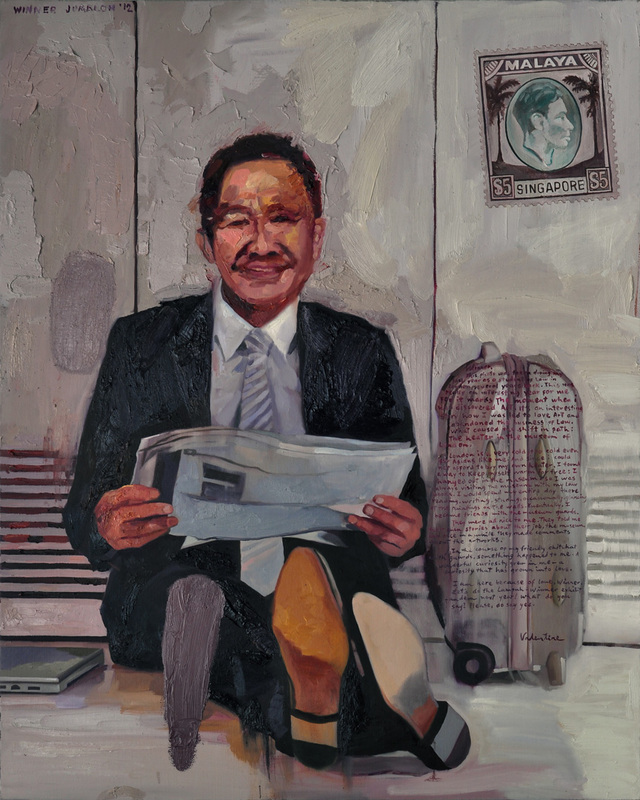 Functioning as artist and archivist, he pores over past conversations, letters, and pictures to create paintings as reservoirs of memory. 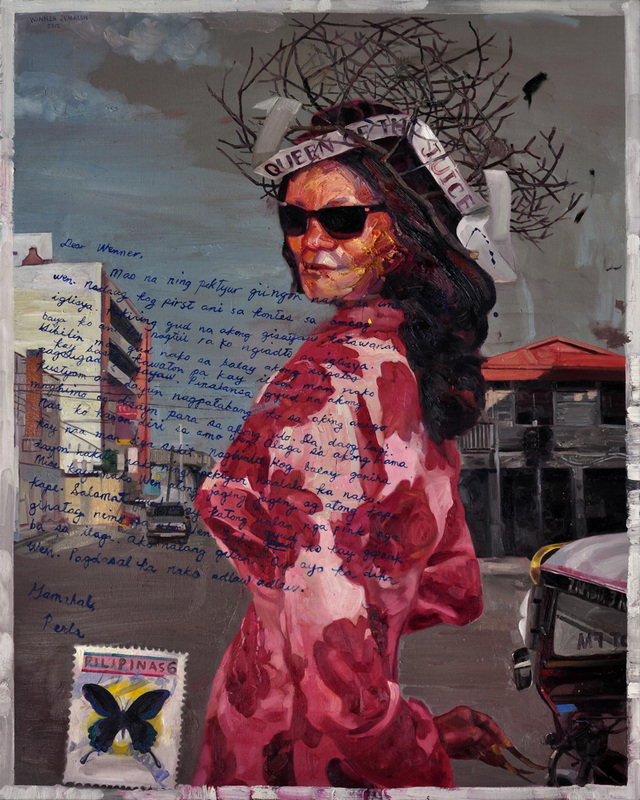 However, the works subvert the modern-day urge to compile information into well-ordered stacks; while we hoard our memories of others and preserve them in row upon row of digital mausoleums, Winner attempts to distill the essence of his relationships by manipulating image, background, and narrative into one painting per persona. The whole of art can be said as extensions of memory, of course. When man made the first images, we invented a way to store memory outside of our minds. Think about every scene, portrait, figurine, and monument as an actual and metaphorical connection to a memory. Abstract mental and emotional symbols alchemize into physical objects. Art can be viewed as parallel to memory, artist Andrea Polli states in Virtual Space and the Construction of Memory. Both employ and integrate the senses, both are representations. 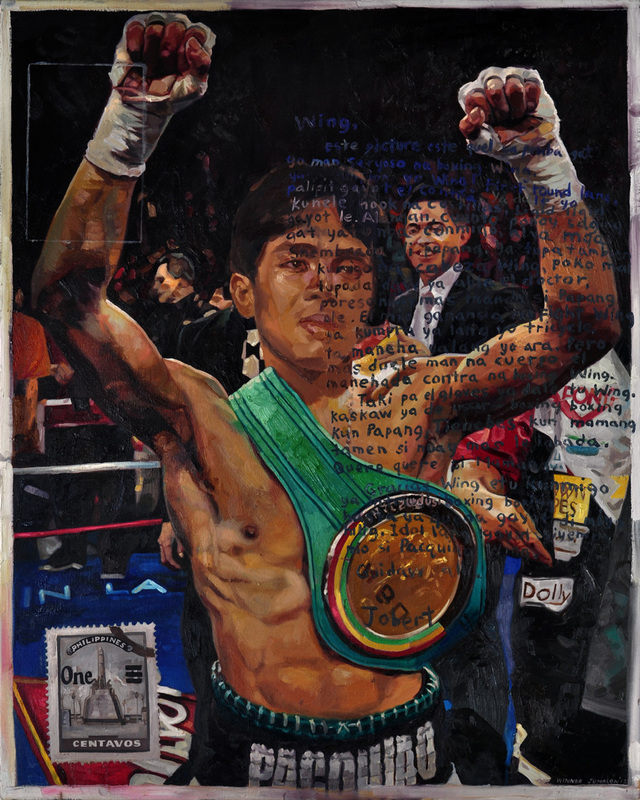 In creating the painting as a representation of memory, Winner takes it further by exploring its associative nature. 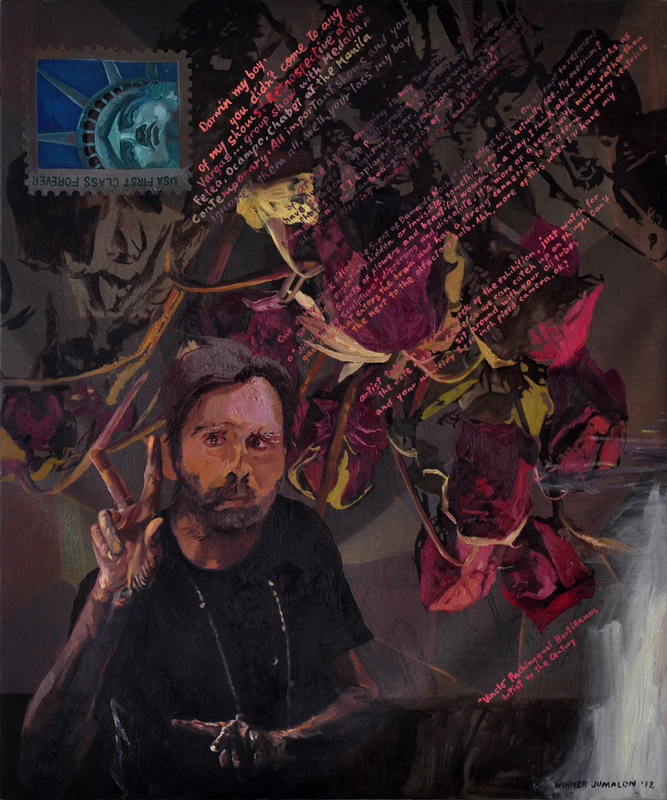 He starts with hard evidence of the others’ existence, gathering actual pictures, letters, and online messages sent to him by the personas in his painting. In the long chain of correspondence, he selects key character elements then starts representing them, letting one element trigger another and so on, until the completed work becomes a protean but potent reconstruction of the past. 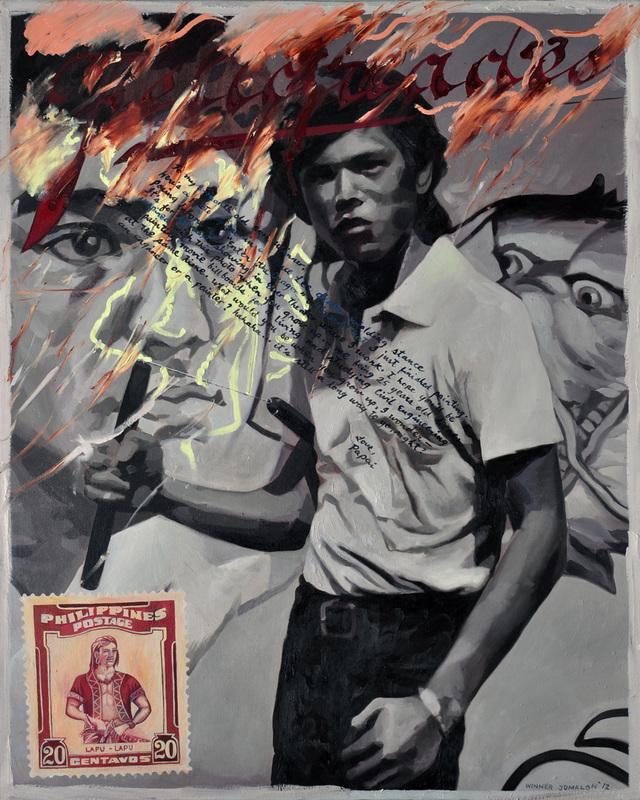 In Perla, he takes a tagged Facebook message and photo sent by a previous helper about winning an Iglesia ni Cristo dance and spins off by incorporating text of the Visayan narrative, a new physical body for his subject, and the architecture of Old Zamboanga City. 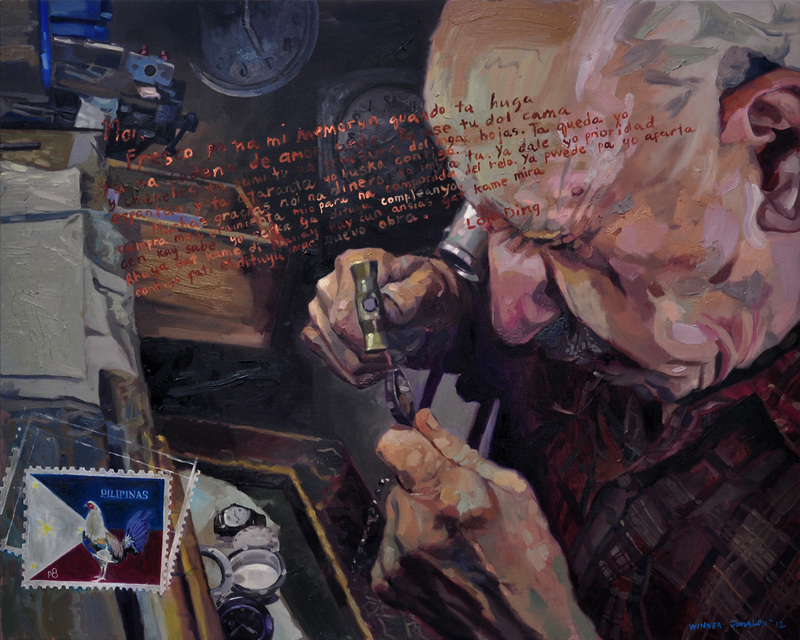 In Lolo Chuding, he takes a 2011 handwritten letter and a 1991 photo of his maternal grandfather who narrates having re-established a watch repair shop and reconstructs it into a background of clocks, forming deist parable of genetic heritage. 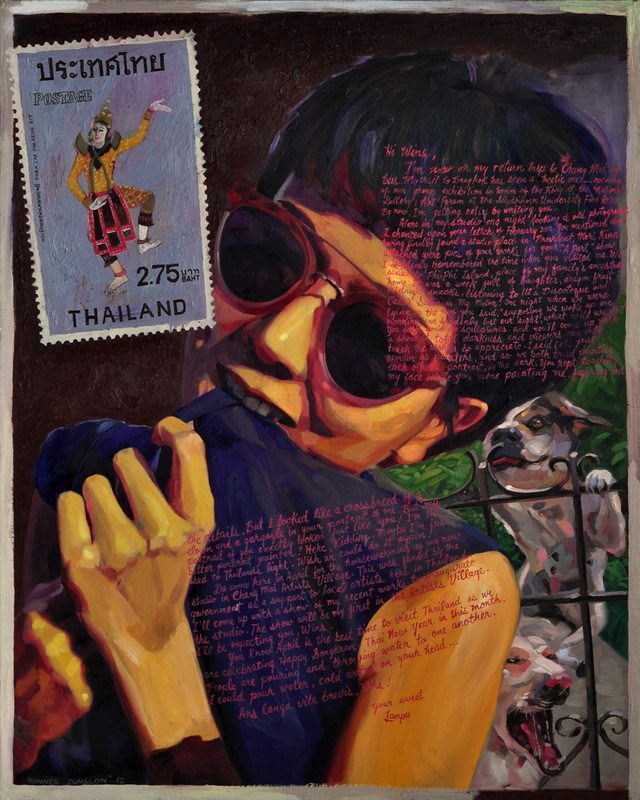 In Lampu Kansanoh, he recalls a souvenir and dedication from Thailand with the young Thai artist and gives us the details of this intimate conversation. 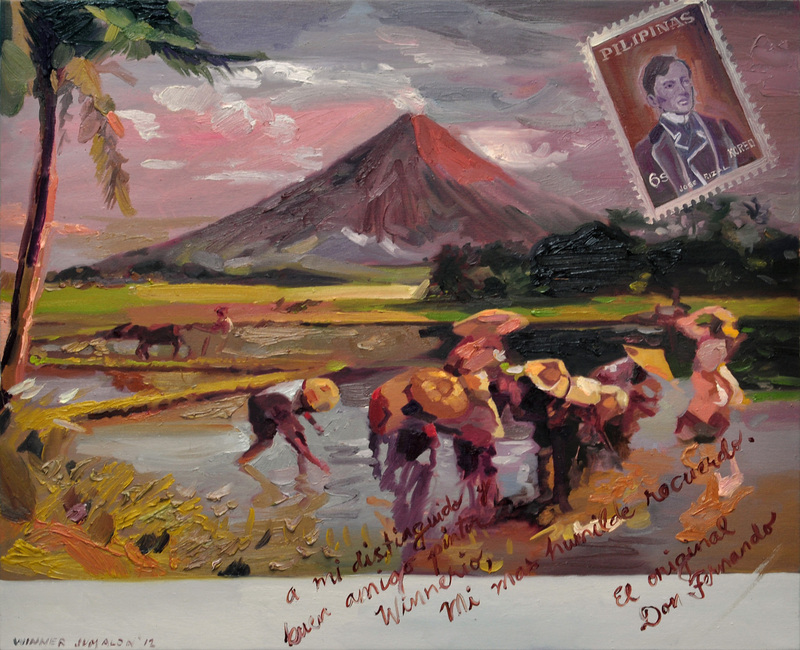 Perhaps the most intriguing painting in the series sheds light on the 6-year correspondence between Winner and Pachingguel Hortillanos, whose recent retrospective at the Manila Contemporary made news when he burned a hole on his own painting with a lighted cigar. 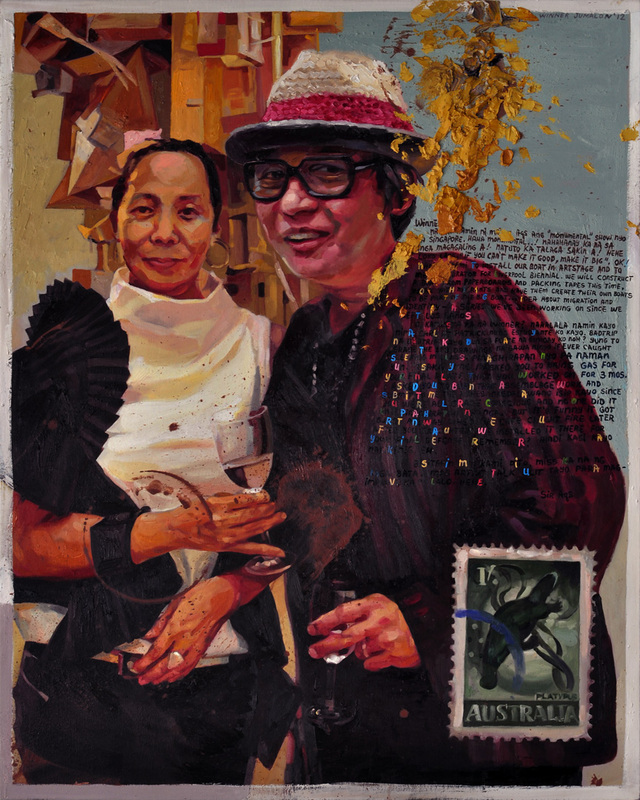 The playful aggression between the young upstart and the old eccentric is evident; it starts with Pachingguel admonishing the artist about his lack of history, and Winner’s snapshot is a response evoking the buried tension between generations. 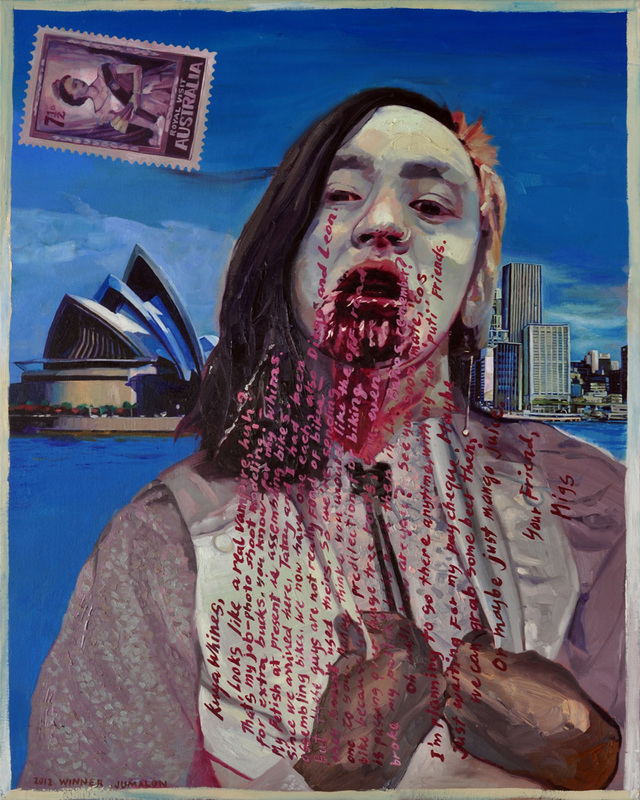 The paintings in One in Mind are not memorials but memory palaces – remnant structures of the mind from the Greeks who devised them as powerful visual methods of remembering. They are Winner Jumalon’s meandering, mnemonic shorthand of each of the lives that have once been a part of his.